Try your hand at winter coat styles. No matter where you’re from, you draw winter coats in the same way you draw spring and fall jackets. Follow the lines of the torso and arms to create the main parts of a winter coat. To show that the model is wearing a winter coat, simply include wintry details that hint at the coat’s function. Add design details such as collars, buttons, pockets, cuffs, hoods, extra length, and a snug fit to show the extra bulk and warmth. You can also use texture and patterns to indicate a heavier or seasonal fabric that’s suitable for frigid winter days. 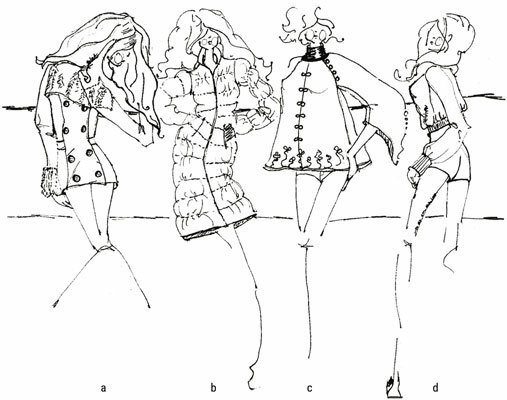 Take a look at a series of winter coat styles: double-breasted pea coat with a large fur collar and fur cuffs, long quilted puffer, short poncho style with raglan sleeves, and a satin bomber jacket with a ribbed hem and sleeves. Draw some high fashion boots that have stretch in the body. Sketch two legs from the knee down with one foot sideways and the other facing forward. 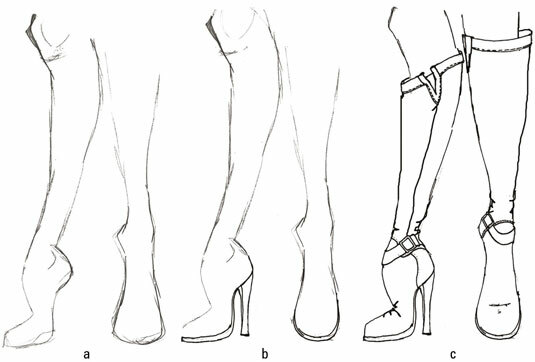 Draw the heel and platform of each boot. On the sideways foot, add two lines coming down from the heel, and on the ball of that foot, draw another line for a slight platform. On the foot facing forward, add a line around the base to show the platform from the front. Add the top of the boots, buckles, seams, and topstitching. Add a buckle across the ankle and a curved seam from the front of the foot around the ankle to the heel. 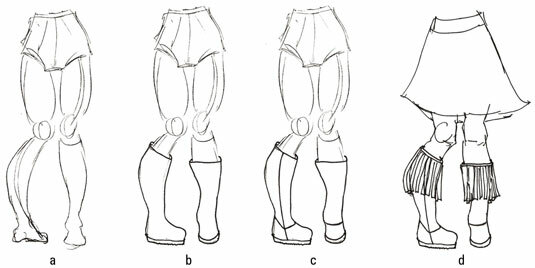 Draw the front view of the buckle on the forward facing foot. End both boots right below the knee with two curved lines, topstitching, and a V shape on the side (this shows the elastic that allows the leather to stretch over the wide part of the calf). Draw a simple yet fun pair of boots for a girl. Sketch the lower torso of a little girl with one foot facing forward and the other turned in toward the other foot. Draw the outline of the boots. For the top of the boots, draw slightly curved lines right below the knees. Start on one side and trace along the shape of the calf down to the foot around and up the other side, connecting to the line below the knee again. Add another line at the bottom of the foot to create the tread. Add the seam details. On the turned boot, add a line down the side for a side seam. End the seam at the ankle, where it turns into two lines going up in a V over the front and around the back of the boot. On the front-facing boot, draw a curve across the ankle to represent the seam. Finish with fringe coming down from the top of the boot. Draw a hip, bunched scarf. Sketch a female upper torso with one arm bent on the waist. Draw a large oval around the neck and slightly above the chest. Draw a circle close to the neck. Add a bunch of short and long curved lines between the circle and oval. At the bottom of the oval, add a rectangular shape with fringe for the end of the scarf. Draw a scarf suitable for a man. Sketch a male upper torso with both arms bent. 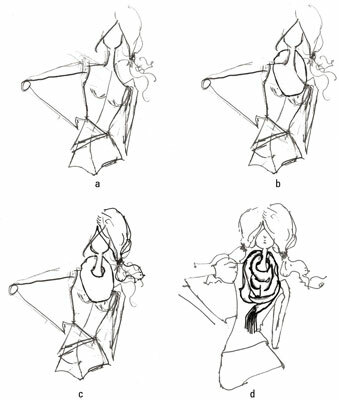 For the part of the scarf that goes around the neck, draw a curved line right below the chin and another curved line just below the base of the neck, creating a curved shape that points down on one side. For the end of the scarf, add a rectangular shape coming down from the pointed, curved shape. Angle the end of the rectangle shape and add fringe. 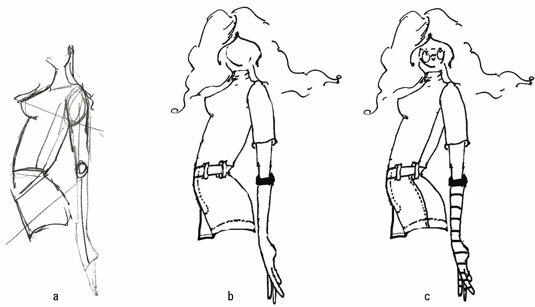 Draw a pair of elbow-length gloves. Sketch a side view of a female torso with the arm closest to the viewer hanging straight down with a few fingers showing. Add a curved line right below the elbow and trace around the forearm and hand to form the outline of the glove. Finish the gloves with a curved-stripe pattern.